The lack of flash support is a massive drawback, 50% of the sites I try to visit use flash and I can’t use the iPad to get to them. It does indeed allow you to play flash movies on the iPad, but how it does it, whilst innovative, is not quite seamless, e.g. When you load up a page that contains flash Skyfire doesn’t automatically detect this… you have to press the ‘video’ button at the bottom left of the browser. Skyfire then analyses the page for a flash tag and if it finds one a small window pops up informing you that some background processing is going on. Behind the scenes the flash movie is copied and converted to HTML5 on a Skyfire server and then streamed to the small popup window. Now all of this takes time and even 30 seconds of background processing seems like an eternity and it somewhat spoils the experience. 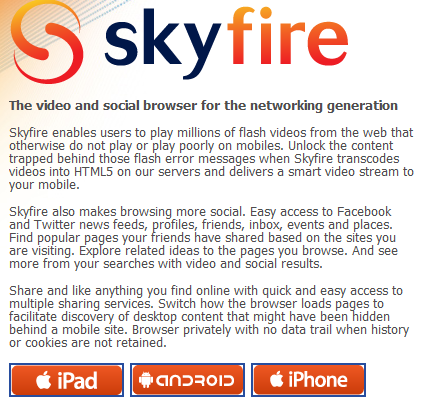 All in all, whilst it may not be the most elegant experience, Skyfire does what it says on the tin and allows you to watch Flash videos. In the grand scale of things, it’s better than having no Flash support at all, but until such times that Apple bury the hatchet with Adobe, this is all we can expect. Previous postHow to make the best ever christmas cake!!! Next postThis time it’s Apple TV… am I turning into an Apple fanatic? ?